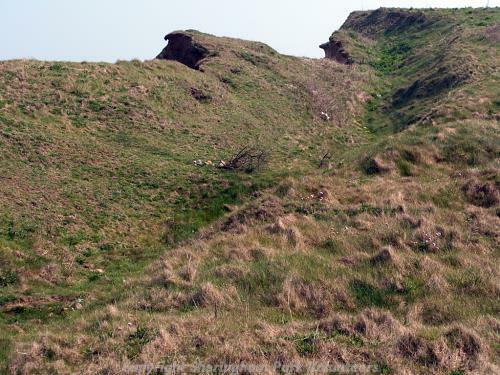 Earthworks of large World War Two anti-tank ditch protecting a gap in the cliffs at Weybourne. A series of pillboxes, barbed wire defences and trenches (NHER 19440 and 38577) surrounded this tank trap. 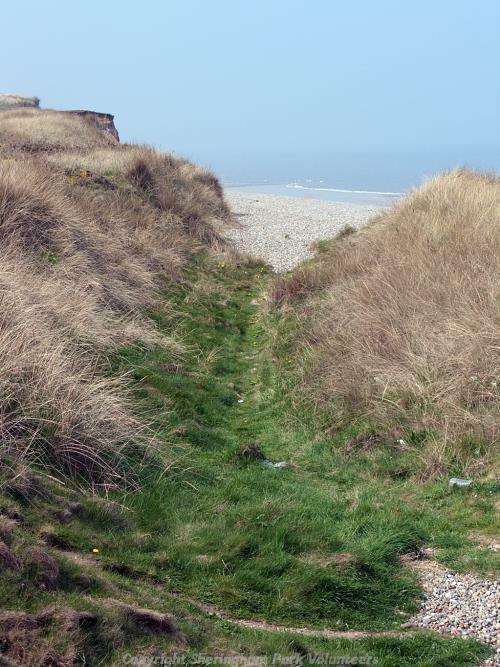 Very rare anti-tank ditch, situated at cliff edge blocking low entrance to beach. Could be World War Two or earlier. April 2004, Norfolk NMP. (Central grid reference altered from TG1275 4357 to TG 1281 4356). The earthworks of large World War Two anti-tank ditch protecting a gap in the cliffs at Weybourne, are visible on aerial photographs from 1940 (S2). The site is centred on TG 1281 4356. The broad ditch, 7m wide, runs from TG 1269 4360 to TG 1292 4360. A 7m wide bank of up-cast material flanks this ditch to the south. A series of pillboxes, barbed wire defences and trenches (NHER 19440 and 38577) surrounded this tank trap. For a full discussion of this site within its World War Two context refer to NHER 38577. S. Massey (NMP), 1 April 2004. E. Rose (NLA), 13 April 2004. May to November 2004. Norfolk Rapid Coastal Survey. Context 238. A World War Two anti-tank ditch was found just to the south of the cliff edge (from TG 12765, 43591 to TG 12913, 43592). It was partly infilled, with backfill deposits visible in the cliff face. It measured around 150m long by 10m wide by 3m deep. J. Allen (NLA), 22 April 2005. --- Photograph: Kent, P.. 1994. KHD 31. <S2> Vertical Aerial Photograph: RAF. 1940. RAF 268A/BR/183 9-10 17-DEC-1940 (NMR).